Well, there isn't any good way to say this, but to just say it. After the hospital stay for diverticulitis and kidney infection, I was hospitalized- AGAIN- for an infection in the tendons of my index finger of my dominant hand. They had to cut open that finger and clean out the infection. When cultures did not reveal what caused that infection, my primary healthcare provider sent me to an Immunologist. I've been doing some medical testing over the last month; testing that we've never done before.... and we found something. The Immunologist ran a gamut of tests to see what was going on with my body, and he found something he had never seen before. and I'm in no need of extraordinary treatment until secondary symptoms arise. This is an abnormality within the blood; it handicaps the immune system; and unfortunately it can look like cancer or a very rare disease that has a dire prognosis; and there isn't a test to determine which it is. Without the secondary symptoms, we are operating under the belief this is benign... non-malignant, and NOT the blood disorder. In addition to the 'big find,' the Immunologist is running more tests on various anomalies and abnormalities he found within my immune system-even down to the cellular level. There are treatments he can offer to help me, but we need to determine what that help should be. My goals are to do everything possible to strengthen my body and my immune system. Regardless what this turns into, I will weather the coming challenges much better, with a body that is as strong as it can get. At this time, I'm forced to relinquish Hooks In Texas. The physical stress is too big of a risk for me. For as much as I love seeing stitchers from across our great state, the responsibility is too much for me, anymore. The only clever words I can find are the Title words of the last episode of M.A.S.H. I'm keeping ChezCrochet.com online, since it is self sustaining, but everything else will need to be evaluated over the next few weeks. For now, I'm done with the doctor visits for a couple of months, and that tells me I'm in no grave danger. I can focus on the positives in my life, and hopefully, get back to stitching soon. Oh, did I mention, I've been doing physical therapy on the hand scattered all through this. All this emotional turmoil, and I couldn't stitch... let me tell you folks... that was a challenge. oh, NO, I'm not going to say the names of the diseases... what little you will find on google, will just scare you half to death. heavy sigh... I can't delay this announcement any longer. I've waited as long as possible, in hopes that situations would improve... but they haven't. I was in the hospital a few weeks ago, for an intestinal AND a kidney infection... and the intestinal infection has flared up again. I had tests scheduled when I left the hospital, and this second round of infection is going to delay those... and has created the need for more tests... which will stretch into the fall. I am having to admit, that I'm not healthy enough to do Hooks in Texas in October. And my three helpers have their own health and family concerns, which was going to make it a real challenge for them to be here in October. So, we've elected to just POSTPONE Hooks In Texas, to sometime early next year. I am hammering out the final details and will make further announcements in the next couple of weeks. It was such a rewarding year working on Hooks In Texas. I had 3 volunteers to help me with the work load of taking our conference to the next level: a hotel- so everything was in one building; a vendor’s room; more classes, and a People’s Choice contest- with nice prizes. We were all excited at how this was shaping up to be an amazing weekend. The Transition Phase of the hotel changing owners wreaked havoc with our efforts: changing dates, elements of our contracts couldn’t be honored, delays upon delays upon delays... and of course, my health. Then, our last visit to the hotel brought new revelations- the renovations and retro-fits, were moving much slower than anticipated. Our registration deadlines have passed, we don’t have enough people to cover the larger expenses of being in the hotel. We’ve run the numbers, discussed options to trim our costs, but words cannot express my trepidations over those incomplete renovations- with our conference so close at hand. It is with a heavy heart, that I’m canceling this year’s Hooks In Texas. There are just too many things working against us this year: health problems (including family) for many of our ladies across the state- I wasn't the only one. Scheduling conflicts with the new date, and larger conferences that same weekend. Everyone is struggling with the economy, even the larger needlework conferences have significant decreases in their attendees. As the days have progressed, I see national uncertainty over the looming election... and here locally, my uncertainty of those incomplete renovations at the hotel. I want to thank the ladies who helped me: Beverly Wildes, Kim Guzman, and Cyndye Scott Batchelor, their efforts have been invaluable this year. And to answer your question before asked: We are NOT giving up. We are regrouping; building on what we accomplished this year, and learning from the pitfalls. 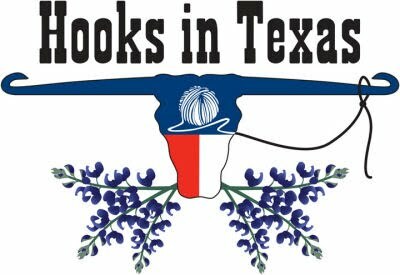 We have a whole year to make Hooks In Texas 2013, something to look forward to. Welcome To Hooks In Texas! We are doing some advertising at Facebook and Ravelry, and I wanted to provide a quick Map for finding all the information you need to know. There is a $40 Registration Fee for the Weekend. If you miss the August 31, Registration Deadline, the Fee goes up to $50. You can still walk-in, but we can't promise what classes will be available. Classes are $10 each, for 2 hours of instruction, and some have an extra supply fee. We have added a People’s Choice Awards Contest, this year! For Class Descriptions, Deadlines, Maps, Menus, Contest Details, just look at the various links in the left hand navigation bar. OR Leave a message at the Hooks In Texas Facebook page. The new hotel owner, refused to let us bring in an outside caterer for Saturday evening's buffet; Clarion demands that you use their In House Caterer. After reviewing the hotel's In House Catering Menu, the executive commitee decided we would just go somewhere else for Saturday Supper. We are okay to bring in Saturday Lunch from other caterers, but not a full fledged buffet. Soup, Salad, and Breadsticks from Olive Garden is still the menu for Saturday Lunch. We will be dining at Feuntes Down Town on Saturday Evening. They are a medium sized restaurant with a comfortable ambience, and they are a San Angelo Landmark eatery for more than 50 years. They offer a full bar, which some of our other choices did not, but we are asking each vehicle choose a designated driver. You can veiw Feuentes' Menu here. This is a pdf file, and you will need Adobe Acrobat to read it. At present, we will be ordering off the menu, and everyone will pay their tab separately. If our numbers climb past certain point, we will need to establish a selective menu for our group. Here is a Map from the Hotel to Feuentes. I wanted folks to see ALL of the things you will learn in this class, and you will be given an opportunity to work with each of these tools to get a feel for them. With this machine, you can create yards and yards of I Cord in just minutes. 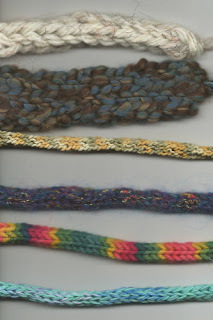 Since this is more hands on, you can add beads to your work as you stitch. This also lets you use those big chunky yarns to make big chunky cords. I will have several different Peg Knitters for you to try, including The Crochet Dude’s newest addition to this ancient tool. Lucet is an ancient forked tool that has been found in Viking and other medieval archeological digs. I’ve seen this on YouTube, but she used only one hook, and you had to remove the loops from the hook to work each round. We all know if you remove the loops from your hook/needle you risk losing a loop while working the rest. I’ve modified the technique, so that those loops never leave the hook/needle. 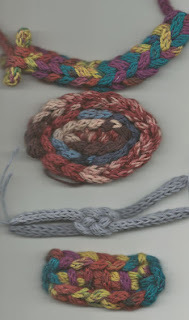 To finish up the class, we will look at what to do with this I Cord once you made it! To reserve your class choices, post your meal choices or dietary needs, or ask questions, please visit our FaceBook Page. This is a much eaiser way for all of us to communicate with all of you. I'm posting the announcements here, to give more folks the information. OH, And ALL of the pages to the Left, have been updated.